A novel nanopore DNA device has been designed that can quickly and precisely detect disease biomarkers at the point of care, and which could be a major advance in personalized diagnostic medicine. A team from the University of Ottawa, in collaboration with the University of Rochester, have produced a solid-state nanofiltered device with essentially two pores in series that transform the identity of individual biomolecules into an electrical signal to allow more accurate measurements of single DNA molecules. Nanopores, molecular-scale sensors that are transforming the field of sequencing, can electrically detect single biological molecules such as proteins or DNA with precision. A key challenge to improve the precision of measurements in DNA sequencing, and also biomarkers for diagnostic applications using solid-state nanopores, is being able to control the motion of the DNA molecules through the nanopore. However, as DNA is a flexible polymer, nanopore devices that can sequence, carry out genome mapping, and barcoded biomarker detection are constrained by the tendency of DNA molecules to coil up before reaching the nanopore, producing complicated signals with no means to filter out the noise from the range of molecular conformations. This new approach overcomes the problem as the two membranes work to untangle DNA molecules by forcing them to stretch out between two pores, filtering the contributions of DNA entropy out of their signals. As reported in in Nano Letters [Briggs et al. Nano Lett. (2017) DOI: 10.1021/acs.nanolett.7b03987], the device comprises three layers: a nanoporous silicon nitride membrane that acts as a prefilter, a biosensor membrane with a single nanopore and a separating spacer layer. The link between the possible configurations of each molecule and how they pass through the pore was made possible by a nanofabrication technique called controlled breakdown (CBD), which causes a nanoscale spark to perforate the thin membrane. 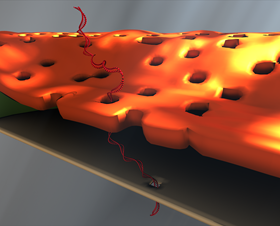 As which layer of the device this happens to can be controlled precisely, a nanopore within an embedded structure can be fabricated using just a couple of batteries rather than expensive electron microscopy. As researcher Vincent Tabard-Cossa told Materials Today, “By pre-stretching the DNA molecule into a set, elongated configuration, more precise measurements are made possible by filtering out the noise that would have resulted from the ‘blob’ of DNA configurations”. The team now hope to design new strategies for further controlling molecular capture and passage that could offer many technological applications, as well as developing a monolith structure by combining the nanoporous filter with the single nanopore sensor into a single integrated device.